when a Muslim woman is killed collecting firewood in Afghanistan, these youth are angered at the fact that their sister was murdered. When a Muslim man is crushed to death in Palestine, they lament the loss of their brother. 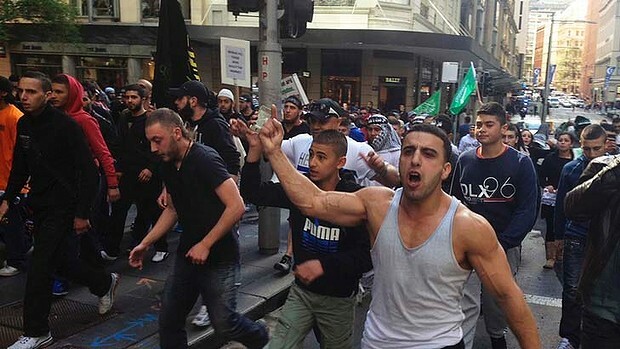 Since the weekend’s protests in Sydney, a number of high-profile Muslims have felt the need to speak out, to condemn the violence and to remind the broader population that this was a minority group – that not all Muslims are violent terrorists. This seems the logical thing to do. After all, we can’t let this ”violent minority” tarnish the image of Islam and Muslims, right? The problem is that such analyses miss the point. They zoom in on one incident and frame their entire discussion around that, as if it occurred in a contextual vacuum. When viewed on its own, of course, the protest makes no sense at all. Why were some protesters chanting ”Our dead are in paradise, your dead are in hell”? When prominent Muslim leaders cannot even begin to fathom how some Muslim youth have mentioned corpses when apparently protesting about a movie, we need to question whether the real problem is that such leaders are incredibly out of touch with the reality of Muslim youth in this country. Waleed Aly has correctly identified that, ”This isn’t about the film”. Correct. Rather than dismissing these protests as an excuse for these youth to ”feel good about themselves” or as a public statement of righteousness, we need instead to give genuine consideration to why our youth are acting in this manner. We need to give the situation context. The reference to corpses made by these protesters is not at all surprising to anybody who has worked closely with the Muslim community. They are referring to those killed in the invasions of Afghanistan and Iraq; they are referring to the many children killed by US drone attacks; they are referring to the Rohingya Muslims burnt to death in Burma; they are referring to Uyghur Muslims being persecuted in China; they are referring to the daily oppression of Palestinians; they are referring to the war on terrorism which they see as targeting Muslims; they are referring to Kashmir, Guantanamo Bay, Chechnya, and the many other places around the world where they witness injustice and persecution. So no, this is not entirely about some poor-quality YouTube clip. These youth are basically protesting against the broader context of Islamophobia, within which this clip is not only being produced and propagated, but also defended as freedom of speech. But there is still a problem. How do we know if these are the real concerns of the youth since they haven’t articulated them in such a manner? And why on earth are they so angry at events entirely unrelated to them? To begin with, many Muslims in Australia do not simply give up their identity as belonging to a global community merely because they happen to live in Australia. Many have not bought the liberal idea of individualism, and so see events happening on the other side of the planet as personally related to them. So, when a Muslim woman is killed collecting firewood in Afghanistan, these youth are angered at the fact that their sister was murdered. When a Muslim man is crushed to death in Palestine, they lament the loss of their brother. It may not make sense to a Western audience, but that doesn’t matter. This is what is angering our youth, and until we start discussing it honestly and genuinely, the confusion will remain. As to the question of articulating these grievances correctly: this is the ironic and very sad part. These youth have been relying on their leaders – their representatives – to do exactly that on their behalf. Instead what they see is a leadership almost exclusively concerned with ”portraying the correct image” of Muslims in the media. Rather than voicing their grievances, they see their leaders capitulating to representatives of the governments they accuse of Muslim oppression. Instead of protecting them from what are seen as some of the harshest anti-terrorism laws in the world, they see their leaders thanking police for raiding Muslim homes; they see their leaders as siding against them, rather than with them; they feel betrayed. And so the anger rages inside them. They’re frustrated, with no avenue for effective expression. They reach breaking point, and decide to do something. Yes, perhaps there is a feeling of catharsis in the waving of fists and chanting of slogans. Yes, it’s obvious that the way they express themselves betrays the message they claim to be carrying. But we should not place the blame entirely on them. We should look towards what’s really lacking in the Muslim community, and for that, we cannot look past the real superheroes in this episode: the present leadership. These Muslim leaders who come out in full force when it’s time to condemn other Muslims in the public, only to welter away and become invisible again once the tide settles. These superheroes, who, rather than voicing the very real grievances of the youth, and defending the interests of the whole Muslim community, seem more intent on representing the voice of an exclusive, overly image-conscious minority. Well, here’s one radical idea: rather than having a collective anxiety attack each time Muslims are mentioned in the media, how about we actually genuinely engage the youth for a change, and speak to them rather than about them? Mohamad Tabbaa is a PhD candidate in law and criminology at the University of Melbourne. He researches issues of discrimination against Muslim minority groups in the West, particularly Australia.